Apparently, it’s a very old mark, used for various reasons including Chapter headings, but nowadays, It is mainly used to be able to identify formatting issues in word processing documents that occur because users have hit the enter key too many times and can’t tell because they are not shown. Hitting the Show/Hide button allows the non-printing characters to be revealed. 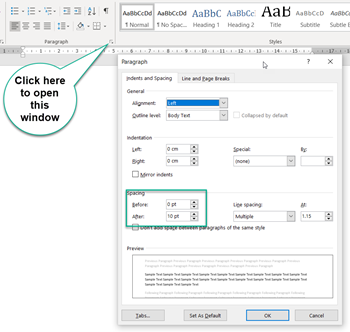 “Nonprinting characters” is Word’s term for anything that takes up space or has a formatting function but does not appear on the printed page, including spaces, tabs, page or paragraph breaks, etc. In this blog post, I’ll go through some of the symbols which will be revealed by the Show/Hide button, what they mean and why you might or might not want them there. The paragraph mark represents a paragraph break. You should see one at the end of each paragraph (if there is not one, you’ll likely find that you have a problem). Ordinarily, you should not see one anywhere else. By this, I mean that you should not be ending lines with paragraph breaks, nor should you be using “empty paragraphs” to create “blank lines” between paragraphs (in most cases, this is better accomplished with Space Before or After in the Paragraph Formatting options). The ¶ contains all of the formatting relevant to the paragraph. You can select it, copy it, and paste it onto another paragraph to copy and paste the formatting. 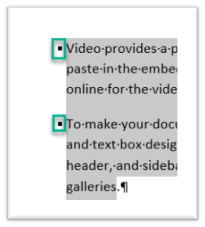 The last ¶ in the document contains formatting for the entire document (header/footer and margin information, for example) or for the last section if there are more than one. Unfortunately, they look the same, so you need to be careful which one you’re using if you choose to use this copy/paste method! These include things like column, page, and section breaks, which are a bit more obvious in their meaning. 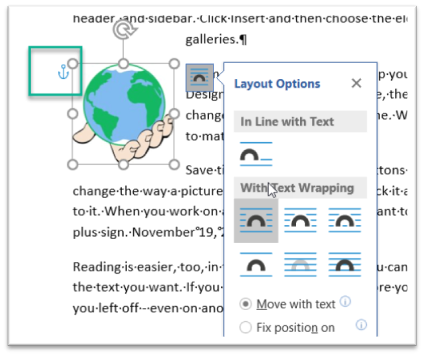 Pagination breaks are applied automatically by Word, or you can add these manually to control where the text should be pushed onto a new column, page or section. To delete these, you can simply select them and press the delete key. Finally, you will sometimes see a small black bullet in the margin next to a paragraph. This indicates that the paragraph is formatted with the “Keep with next,” “Keep lines together,” “Page break before,” or “Suppress line numbers” property. 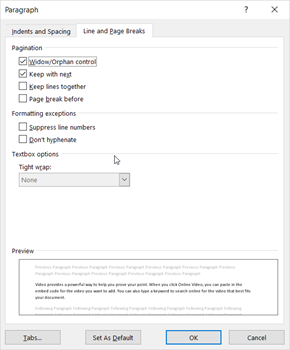 These settings are found on the Line and Page Breaks tab of the Paragraph dialogue box; accessed through the dialogue launcher in the bottom right corner of the Paragraph group on the Home tab. You can also double-click on the “bullet” itself to bring up this dialogue with the Line and Page Breaks tab selected. Word’s built-in Heading styles are formatted as “Keep with next” by default, so you will always see these bullets next to them. 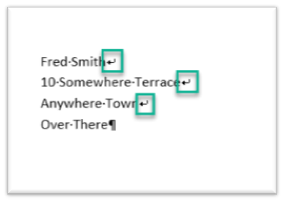 In most fonts, and certainly all Windows “core fonts,” a· small· raised· dot· represents· an· ordinary· space· Be sure you don’t have space · · characters · · where · · they are · · not · · needed. If you are tidy-minded, for example, you won’t want a string of them at the end of a paragraph where your thumbs relaxed on the spacebar while you stopped to think.· · · · · · · · · · · · · A degree symbol ° represents a nonbreaking space (Ctrl+Shift+Spacebar), which you can use to prevent words from being separated at the end of a line. This is useful for keeping dates together (so you don’t end up with November 19, 2018 being spread over two lines). An arrow pointing to the right represents a tab character, where you have pressed the Tab key. In tables, you will see one additional character, the universal monetary symbol (¤). Upon close inspection, a circle with four lines radiating from the corners can be seen: ¤. This is the end-of-cell marker. It is a little like the paragraph mark in that it contains paragraph formatting for the last (or only) paragraph in the cell, but it also holds formatting for the cell. The same mark at the end of each row is the end-of-row marker, which serves a similar purpose with regard to row formatting. Another very important nonprinting character is the anchor symbol – when working with floating objects it’s often crucial to know where these are positioned relative to the paragraph or page. For example, as in the image below, the image has been placed relative to the paragraph, and hence the anchor symbol appears next to the beginning of the paragraph. Before printing or emailing your document, it’s always a good idea to proofread it to pick up any obvious mistakes. In fact, it’s best to proofread your documents twice; once for content, with nonprinting characters off (as they can be distracting when reading); and a second time with nonprinting· characters · visible, · so · that · you · can · check · for redundant line breaks, space · · · characters · and · the like. How many times have you had trouble with a blank page at the end of your document and can’t figure out why? Now you know why, by showing the paragraph marks you will likely find there are too many of them at the end and you really only should have one. This entry was written by colinfoster, posted on November 19, 2018 at 10:49 pm, filed under Microsoft Word, Tips and Tricks and tagged anchors, Backward P, cell markers, Formatting, Keep lines together, Keep with next, line break, Nonprinting characters, Page break before, pagination breaks, Paragraph formatting, Paragraph marks, Plicrow, Show/Hide button, Space after, Space before, space characters, Suppress line numbers, tabs. Bookmark the permalink. Follow any comments here with the RSS feed for this post. Comments are closed, but you can leave a trackback: Trackback URL.